Spread a bit of love as we begin the new year with some heart themed crafts, activities and (free) printables. 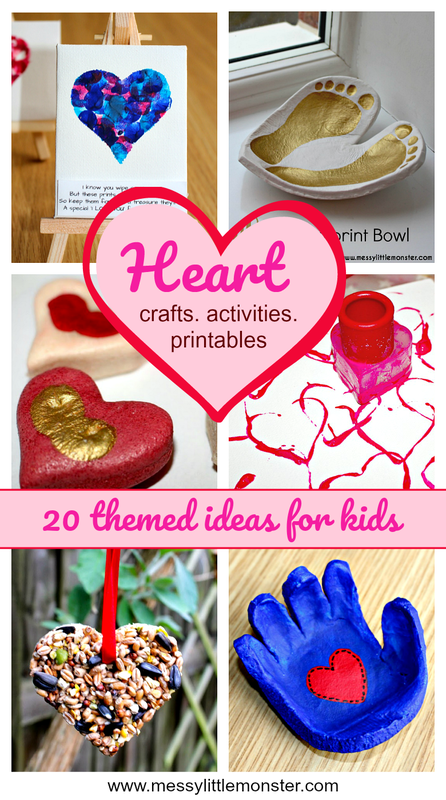 We have put together a collection of over 20 heart themed project ideas for kids to have a go at while they are stuck inside during the cold weather. There is something for everyone, toddlers, preschoolers and older kids too! 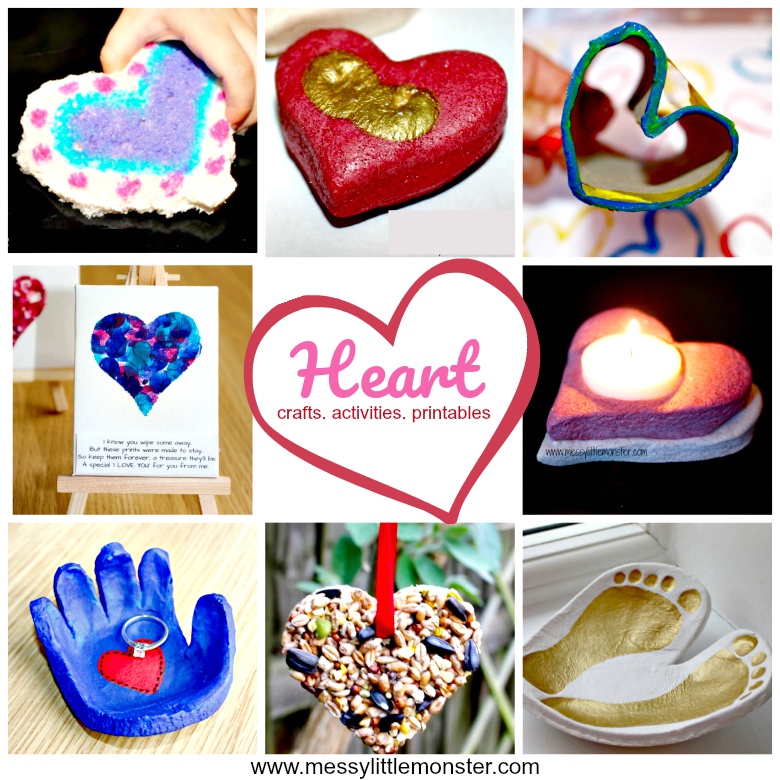 Fingerprint heart magnet - Use salt dough to make some little heart magnets and finish them off by using gold paint to create fingerprints in a heart shape. Handprint bowl - I love this handprint shaped bowl made from salt dough, complete with a heart painted in the centre of the palm. Fingerprint heart keyring - Using polymer clay you can easily create heart shaped keyrings imprinted with little ones fingerprints. These make perfect little gifts for loved ones. Clay footprint bowl - One of my favourite heart crafts. Make a clay shaped heart bowl with your child's tiny footprints imprinted into it. These bowls are so easy to make but have a professional looking finish. Heart Candle - Use coloured salt dough to create heart shaped candles. They are easy to make and give children a sense of achievement when they have made them. Handprint frame - Make a salt dough handprint with a heart cut out in the centre to frame a special photograph. Fingerprint heart poem - Simply add fingerprints around this cute poem in a heart shape and you will have an adorable keepsake. Postcards - Complete with a heart design stamp these cute postcards are prefect for encouraging little ones to write and receive notes. Heart Glasses - Colour, cut out and then wear these cute heart shaped glasses. Lots of fun without much preparation! Handprint heart poem - Add handprints above a cute poem about treasuring your child's handprints. Tiny heart notes and envelopes - Make tiny love notes by writing on the printable hearts and then folding them up into envelopes. Your child will love having one put under their pillow or in their lunch box. Painted heart toast - A fun activity that kids big and small will love. use edible paint on bread to create some edible heart shaped artwork. Marbled Heart - Use shaving foam and paint or food colouring to create colourful swirls and then print them onto heart shapes. Kids love this fun art process an the resulting artwork looks really effective. Heart Bag Craft - A very easy craft that doesn't involve too many resources or much mess! The finished bags look really cute. Cardboard tube heart printing - Fold a cardboard tube into a heart shape and use it to paint heart shapes. This is a great activity for creating heart art or for learning shapes. Heart cookie cutter painting - If you don't want to make hearts from cardboard tubes use a cookie cutter instead! No mess painted heart - Avoid the mess by painting inside zip lock bags. I love the rainbow colours used in the heart artwork. Salt dough hearts - A very simple craft which involves mixing two colours of salt dough together to create some little salt dough marbled hearts. Cherrios heart bird feeder - Work on fine motor skills by threading cheerios onto a pipe cleaner, bend it into a heart shape and hang it out for the birds. Heart shaped book - Make a heart shaped zig zag book from card and fill it with all the reasons that you love someone. Heart scribble mug - Using a simple technique even toddlers will be able to create the perfect heart shape on these heart scribble mugs. Mini heart canvas and poem - Fill a heart shape with fingerprints, add a cute poem and you have the most adorable keespake! Bird feeder - A gift for the birds! Make them a heart shaped bird feeder using a cookie cutter and a few simple ingredients. Sugar Scrub - An easy sugar scrub recipe with the addition of tiny hearts would make a perfect gift.